Club 21’ x 7’ (640cm x 213cm) Aluminum Portable Goals. 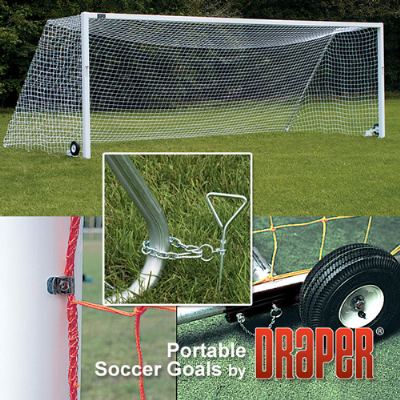 Draper’s lightweight Portable Soccer Goals have a 4" (102mm) aluminum post face and crossbar design. A unique corner attachment system allows for ease of installation and the elimination of all protruding hardware on the front and sides of goal. Features a white powder coated finish and edge radius for player safety. Backstays are galvanized steel tube and provide up to 3’ (91cm) top depth. Net clips hold the net securely to the face of the goal. All Draper Portable Soccer Goals come standard with nets and built-in wheel kit for easy transport, rear stabilizer bar and ground anchor kit for player safety.